Osmonics’® unique one step manufacturing process continuously extrudes and thermally bonds pure polypropylene microfibers into a complex filter matrix. Microfilaments plus precise control maximize the positive filtration characteristics of graded density, tight micron cutoffs and maximum void area with millions of tortuous paths. This fully automated manufacturing process assures consistent quality, filter to filter, year in and year out. New thermal and vacuum finishing procedures produce exceptionally clean filters imprinted for easy identification in the field. it is not strings of yarn mechanically wound around a separate core with added lubricants and anti-static agents. it is not short chopped fibers molded together with chemical binders. it is not layers of non-woven microfibers. Pleated, molded and layered microfiber cartridges function for the most part only as surface filters. 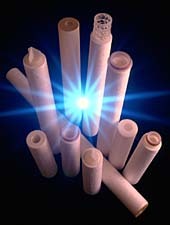 Particles collect primarily on the surface, blinding the filter and reducing its effective life. no surface blinding, which reduces flow and increases filter changeouts. patented thermally-bonded blown microfiber process assures consistent performance, filter to filter. contains no wetting agents, solvents, anti-static agents, binders or additives of any kind. incinerates to trace ash with no hazardous volatiles, for easy disposal. meets the requirements of the United States Food and Drug Administration (FDA) for food and beverage contact. continuous construction in lengths of 1 ½ in. (3.8 cm) to 50 in. (127 cm) with no joints or welds. self-supporting media requires no separate central core. marked with micron rating right on the cartridge for easy filter identification. thermal and vacuum finishing procedures virtually eliminate manufacturing debris. integral pure polypropylene end adapters fit filter housings without bypass. machine packaging and sealing of each cartridge provides clean filters in the field. automated, consistent manufacturing assures reliable performance and repeatable results year after year. Proprietary technology supported by 23 patents made Hytrex filters unique in the cartridge filtration industry. Since 1978, field experience in hundreds of applications has proved Hytrex filters’ superiority. Thousands of repeat customers have confirmed Hytrex filters’ value. Osmonics’ research, engineering and manufacturing expertise has generated further improvements to Hytrex.